The "SKINNY" On Starting Up: 22. Law Firms! Oh Boy! 22. Law Firms! Oh Boy! So I have been shopping for a law firm and I've been told that find a good lawyer is like dating. Well I can definitely say my first two law firms I met were like bad blind dates. They didn't know about founder stock and did not have any other type of billing other than the traditional model. They also looked at me like I was wasting there time. Well I left feeling like a short fat kid on a date with a super model. Rate by the way was $600 hour. Next I met a firm with that was a jack of all trades and also was a respectable $200 and hour. They didn't know a ton of stuff on the start world and left me questioning if they would be a good fit??? If this was dating I would compare this to your date asking to skip dinner and just go back to your place. If you get my drift. So, just when I thought I might end up alone and never find my one true love... A fellow start up recommended the law firm they are using. At this point I have stumbled through enough of a learning process to act like I knew what I was doing. Also at this point I also knew what I wanted. 1. Differed billing until my first funding round. 2. Firm that would bill in 1/10th hours. 3. Wanted them to attend my board meetings when I had them, for free, so they were kept appraised of what the company was doing. 4. Was entrepreneurial/start up focused. 5. Actually new what Founder stock was and why I needed it. I'll show an example of this later in this blog. 7. I also wanted someone who was hungry. Would hussle. Work hard. Etc. And didn't act like I was a dumb meaningless entrepreneur cockroach. 8. And over all there had to be good chemistry between me and the lawyer. Well gosh darn it. If this was a dating, it ended up being a magical date that never seemed to end and when it did end it ended with... wink wink, breakfast! So how about that... I actually have council. I just signed my engagement letter and it is official. The Feinberg Law Group is now partnered with SKINNY prices. To be specific I am working with Jeannette D. McLaughlin and is billed out at $350 an hour. Ask to get a sample of a bill? Say, I have heard it is pretty common practice for a lawyer from a firm to attend board meetings, when there held, at no charge. This keeps the law firm abreast of business developments within the start up. Does your law firm offer this? I would appreciate getting an upper estimate for incorporating and a lowest estimate? This will keep them honest when a bill starts to run up. I talked to one law firm that bills in 1/10th hourly increments. Is this how your law firm does it? Most clerical duties are done by a paralegal but are certain clerical activities performed by an attorney billed out at a paralegal’s hourly rate? I think we discussed this... telephone calls fewer than a certain number of minutes are not billable but what is that limit? How are email exchanges handled? Can you please send me a written engagement letter that spells out billing arrangements: hourly fees, flat fees, contingent and differed fees, retainers? Creation of a Class F Founders stock that has 2:1 board votes per founder and 10:1 voting power over normal common stock. Class F shares vest monthly, without a typical year-long “cliff,” in order to act as compensation for founding teams, and they offer something called “single trigger acceleration,” which allows one founder to leave without hurting co-founders. Class F holders get acceleration on change in control and approval rights on new investments, liquidity events, Board size, and dividends. “FF Class,” a special stock class that also give founders special rights, but focused mainly on letting them cash out early. This allows founders to cash out a small percentage of their stake in a funding round so they don’t have to wait until the company is sold or goes public. The FF has a single preference clause that distinguishes it from all other stock. It is convertible to any future class of stock, when certain conditions are true. For example, the holder of FF can convert it into say, a Series B class of stock and sell it to investors, at which point it takes on all the rights and preferences of Series B stock. But it can only be done during the new issuance of that Series B, and only when that Series B is sold to investors; you can’t convert randomly. Let’s look at a simplified example to identify some of the problems with common stock. A five-year-old company with $10 million in revenues decided to sell for $50 million in cash. The company has raised $10 million for 25% in preferred stock. The investors have a 1.5 liquidation preference that provides them with $15 million on exit, and they also participate at 1/3 of the remaining proceed as a result of preferred dividends, providing investors with roughly $27 million of the $50 million in proceeds. If you pull 10% off the top for closing related expenses, common stockholders are left with just under $21 million. In this example, a CEO with 10% in common will stand to earn $2.1 million on a 5x revenue sale for $50 million. An investor with 10% in preferred will stand to earn $10 million. It is likely that the CEO has taken below market compensation for years to get the company off the ground, which may average out to $500,000 of lost wages over five years, assuming that the CEO earned nothing for some period of time. It is also likely that the common shareholders, who are often management and employees, will be asked to bear the burden of an escrow, earn-out, or other type of hold-back. If 20%, or $10 million, is held at the time of close, the CEO would walk away with $1 million, $500,000 of which makes up for lost wages. This simplified example does not factor in the impact of having to purchase options, which diminishes the value of common further. 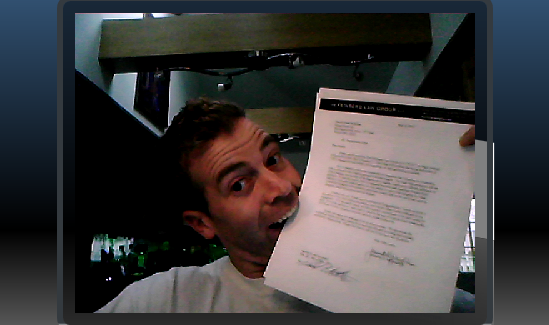 Me with my newly signed engagement letter with my Law Firm. Not sure why I'm biting it... I am a goof. But I am a goof with a Law Firm. Booooyaaaaa! The Entrepreneur's Guide to Business Law by Constance E. Bagley and Craig E. Dauchy 4th ed.